Charles Ringler last week bought from P.A. 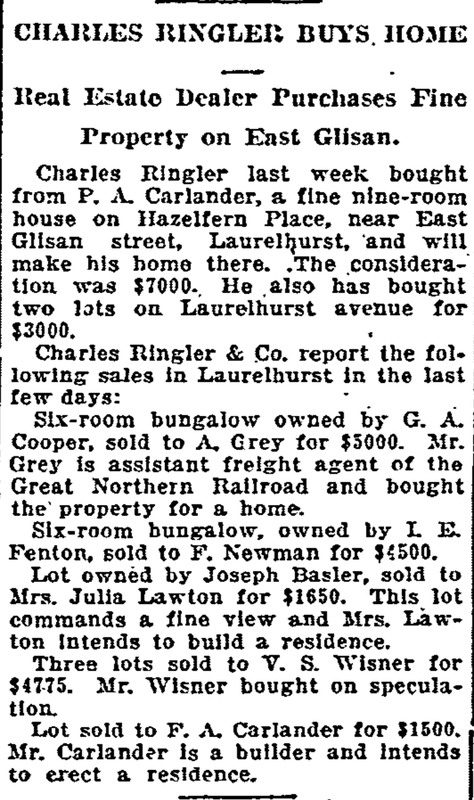 Carlander, a fine nine-room house on Hazelfern Place, near East Glisan street, Laurelhurst, and will make his home there. The consideration was $7000. 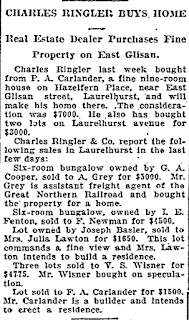 He also has bought two lots on Laurelhurst avenue for $3000. Six room bungalow owned by G.A. Cooper, sold to A. Grey for $5000. Mr. Grey is assistant freight agent of the Great Northern Railroad and bought the property for a home. Lot owned by Joseph Basler, sold to Mrs. Julia Lawton for $1650. This lot commands a fine view and Mrs. Lawson intends to build a residence. Three lots sold to V.S. Wisner for $4775. Mr. Wisner bought on speculation. Lot sold to F.A. Carlander for $1500. Mr. Carlander is a builder and intends to erect a residence. The tall, stately first, specimens preserved from the dense forest that at one time covered the district where Portland stands will form the motif for the development of Ladd Park. This conception is embodied in a preliminary plan submitted to the Park Board by Park Superintendent Mische. In order to carry out the idea the ground is to be developed so as to accentuate the position of the trees and to encourage their continued longevity. The existing pond is to be enlarged and deepened to provide for an overflow to meander, rivulet-form, under the trees lower down the little valley and with the placing of dams at frequent intervals the effect will be to create a number of miniature cascades. In the event that the water flowing from the Ladd spring should be unavailable or otherwise objectionable, the supply will be obtained from the city water system or an artesian well. It is proposed that the rivulet shall be shaded densely and be kept as shallow as possible to prevent the growth of aquatic plants choking its flow. The system of walks will be so arranged as to control a tendency towards short cutting, yet permitting of a minimum amount of walk area and maximum convenience of travel and landscape effect. The flatter areas are to be open to games, picnicking and fiestas while the steeper areas are to be devoted to arboreous and shrubby vegetation to add an enriching element to the park. Only one of the smallest trees must be removed to make way for the rivulet. All the other firs are to be added to or by hollies, mountain laurel, rhododendrons, azaleas and similar plants. It is proposed to provide such necessary structures as shelter and comforts and such minor objects as seats, fountains and light standards but not to introduce buildings of a conspicuous size. All building structures coming into vision are to be made secondary to the landscape. “The plan proposes a development of a strong individuality for the park, one not possible in a similar way in any of the other park properties. It is distinctively an interior park with views wholly within the tract and its development recognizes the feature as necessary to establish a highly ornate property, self-contained a without outward dependence other than for water supply. One of the busiest places in Portland is to be found in Laurelhurst, where improvement work of every kind and character is in progress on a large scale than ever before. Street grading and paving, laying and parking (illegible) sidewalks, cutting of streets through the more elevated portions by means of steam shovels, and residence construction are under way in different portions of the addition. Nearly all of the improvement work in the west half of the tract is completed and virtually all of the grading is finished in the east half. The grading crews are just winding up the southeast quarter. Hard surfacing has begun in the streets and north of East Glisan street. Thousands of tons of gravel, sand and cement have been delivered on the tract ready for paving the east half. East 39th street, south of Glisan, is ready for a coat of asphalt. All improvement work is progressing with the utmost speed as the owners of Laurelhurst have expected the contractors to complete the job this year. More than $1,200,000 has been expended in improving the tract and when the program of improvement, as outlined by the company’s engineer, is completed, fully $1,750,000 will have been expended in the work. This programme includes the surveying and grading of the tract, hard-surfacing the 25 miles of streets, and laying of 50 miles of sidewalks and curbs, the installation of complete sewer, water and gas systems connecting with every lot in the addition, putting in of curb cluster lights and planting of shade trees on every street in the tract. One of the most interesting features of Laurelhurst is Ladd Park, which embraces the 35 acres of woodland in the southwest quarter of the property. Park Superintendent Mische has just completed and submitted to the Park Board a plan for the development of Ladd Park. Among other improvements proposed to be made in the park is the enlarging and deepening of the pond near the center of the park to such proportions as will give it the dignity of a small lake. Every effort will be made by the superintendent to preserve the fine fir trees in the park and to encourage their longevity. For this reason, it is probable that a regular playground will be provided although the plans of the superintendent calls for such park features as sand courts, the wading pool, the croquet grounds and tennis courts. There are nearly 100 new homes in Laurelhurst. Since January 1 residence construction to the value of fully $250,000 has been done in the addition and other have been contracted for which will increase this sum by a second $250,000, before the end of the present building season. All of the new residences in Laurelhurst are of the better grade of houses costing from $3500 to $15,000. The finest home in the addition—that of Charles K. Henry— crowns a splendid site at the intersection of East 39th street and East Glisan street and overlooking the greater portion of the northwest quarter of the city. Several of the most extensive residence builders in Portland are operating on a large scale in Laurelhurst. Among these is George W. Priest, who recently bought an entire block in the addition and plans to improve every lot with a house to cost $5000 or more. C.R. Lewthwaite, A.W. McCain, J. Fenton and P.A. Callander are other speculative builders who are operating in Laurelhurst.